New year, new you.. that’s certainly what I told myself as the clock struck twelve on new year’s eve. So much so that I have signed myself up for The British 10k London Run on 14th July 2013. What was I thinking?!? From here on in, I shall be talking health and heart-rates to speed and stamina super snacks. Well, at least I hope so! Here’s a fab little recipe for Swiss-style Muesli from River Cottage man of the minute, Hugh Fearnley-Whittingstall, that I am going to try and recreate to start my day in a super healthy way. I love the fact he’s soaked the oats in orange juice to create an unusual and sweet flavour rather than the sawdusty rabbit food that I associate with traditional muesli! 1. To make the muesli, put the oats in a bowl. Roughly chop larger dried fruits, such as apricots, dates and prunes. Leave the nuts whole, or chop them roughly if you prefer. Add the fruit and nuts to the oats, together with the wheat flakes and seeds if using, and stir to combine. Tip into an airtight container, seal and store in a cool, dark place until required. 2. 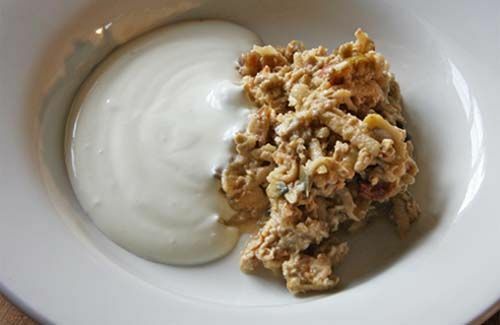 For a serving of muesli, put about 50g of the muesli mix into a bowl. Coarsely grate or finely chop the apple (including the skin) and add this to the muesli. Squeeze the orange(s) and add the juice to the bowl (or use milk, if you like). Stir to blend everything evenly and leave to soak for about 10 minutes. Finally, sprinkle over just a little sugar or trickle over some honey, add a good dollop of yoghurt and serve. Posted in fitness, leisureTagged 2013, breakfast, chef, health, hugh, muesli, recipe, running, tvBookmark the permalink. The hardest part of training is starting out, when your muscles complain all the time because you haven’t used them in so long. Once you get going, increasing the mileage is a lot easier! And fingers crossed for a dry July! Soak oats (and dried fruit) in (squeezed) orange juice. Tip of day. Great. Thanks. Good luck with run, and pre-run panic. I have yet to hear anyone who has finished a charity run, regret it! Thank you! Unfortunately with all this snow we’re having, my training has hit a stand still – it seems as if I’m making excuses. At least I’ve got plenty of time until July.